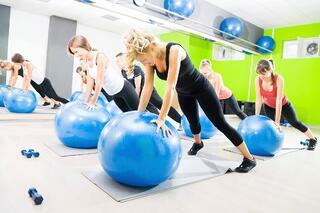 Group fitness is becoming incredibly popular for a variety of reasons. The group atmosphere is a special environment that will inspire you to give your all and keep on coming back for more. If you have been working out by yourself for an extended period of time or if you feel as though your workout routine has gone stale, group training is exactly what you need. Group training allows you to feel as though you are a part of something that is larger than yourself. In a nutshell, it makes you feel as though you belong. Going all out with 20-30 other people by your side is certainly more fun that lifting weights all by yourself. When you skip your solo workout, you don't let anyone down but for yourself. However, if you ditch your friends by skipping your group training session, you will face some sort of backlash. This is precisely why people are so motivated to participate in group training. It creates a team environment in which you feel as though you owe it to yourself as well as your friends to show up to the regularly scheduled sessions. Though most people are interested in maintaining their health, few know exactly what they should do once they step foot in the gym. There is plenty of uncertainty to the gym environment. Do you know whether you should start out with crunches or hit the treadmill? You might not know when the best time is to take a break. Maybe you aren't sure about your form. Group training eliminates all of these concerns. It provides the structure that is missing from your gym routine. The classes are structured with pre-defined warm-ups that proceed to a balanced workout and a cool-down period. Each component is led (and timed) by the class instructor. You can lean on him to coach you through each segment of the workout so you don't have to worry about over-exertion or suffering a preventable injury. If you have been performing the same routine over and over again, you will likely admit that it has become a bit boring. Group fitness is the polar opposite. These classes incorporate a variety of exercises, music and participants. The classes always feel fresh, motivating you to show up on a regular basis and renew your membership. Incorporate a wide variety of group training class types into your gym routine and you will find that there is always at least one class that suits your particular mood. As an example, step aerobics will be available for those days when you feel energetic and yoga will be available for instances when you desire a more laid back workout. Adding to the variety is the fact that instructors can teach all different types of classes, exposing you to new personalities and styles on a regular basis. You likely have a strong interest in physical fitness yet you might not be sure how to perform specific exercises/routines, especially those that require non-traditional equipment like TRX suspension bands. Group training will expose you to fitness aficionados who show you how to engage in physical activity the right way. The instructor will watch you to ensure that you are performing exercises in the proper manner, ensuring your safety as well as the efficacy of your workout. These benefits, among many, make up several reasons why group exercises have spilled into the mainstream. Get the most bang for your buck and explore youre gym's classes today!